The distilling process is similar to most other operations in Vinsight except that you have big volume changes as you put lower alcohol mashes, low wines, heads, tails or heart into the still, and you get out less but higher alcohol hearts, heads and tails. The ABV features in Vinsight help track how many LALs or PGs you have in and out of the process and how much alcohol you have lost if any. Vinsight has built in support for dip charts that let you enter a dip value and have it convert to a volume directly in the bulk operation you are working on. You can find more information on dip charts and how to set them up at Dip Charts. If you have dip charts set up, you will be able to enter a dip value, rather than a volume, when creating or transferring product with operations. You can record and view vessel information such as volume, alcohol per volume (ABV), temperature and specific gravity, and view the progress of ferments over time, in the ‘Lab Analyses‘ part of the App (Analyze > Lab Analyses). You can view this information recorded here on a graph, as well as in table format. This area of the App is highly customisable and you can set it up to include any measurements or information you wish to record. (See Settings > Analyze > Analysis Sets) For detailed information on how this part of the App works, see Ferments. The ABV measurements recorded here will be carried through to any operations carried out with that vessel. You should record the volume emptied from your mash or wash tanks so that you have an accurate volume that filled the still, in the example below we have filled the still with 400L. Checking Litres of Alcohol (LALs) or Proof Gallons (PGs) in and out. 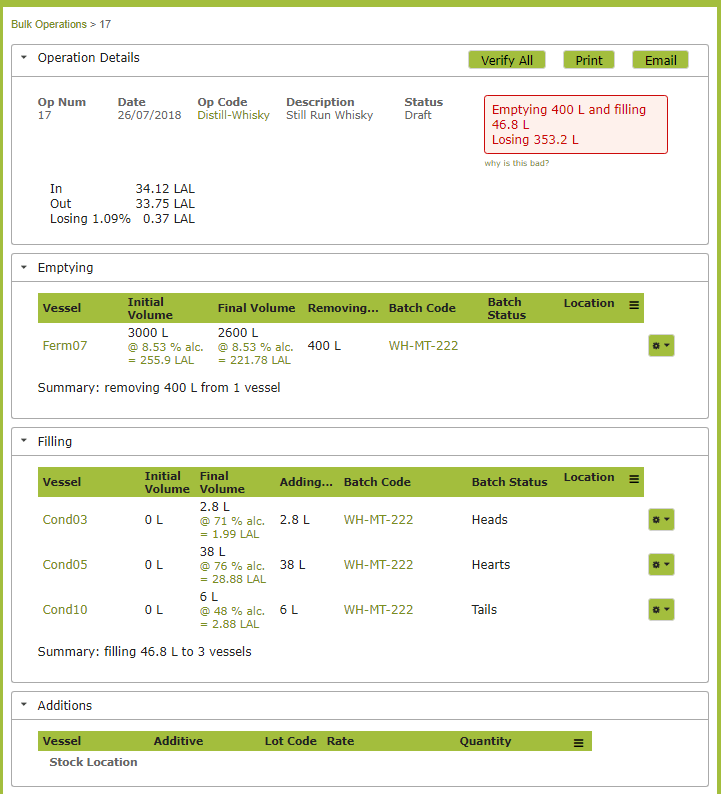 With any operation transferring bulk in and out of vessels, Vinsight will track the alcohol content and alert you if there are significant discrepancies. If you get such a warning you should check you have recorded the operation correctly and that your ABV measurements are correct. These warnings are simply there to highlight discrepancies and prompt checks before product moves further through the production cycle. Currently a warning relating to significant changes of volume, requires you to enter a reason for the discrepancy. 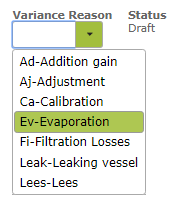 Here you would record the reason for discrepancy as being ‘Evaporation”.